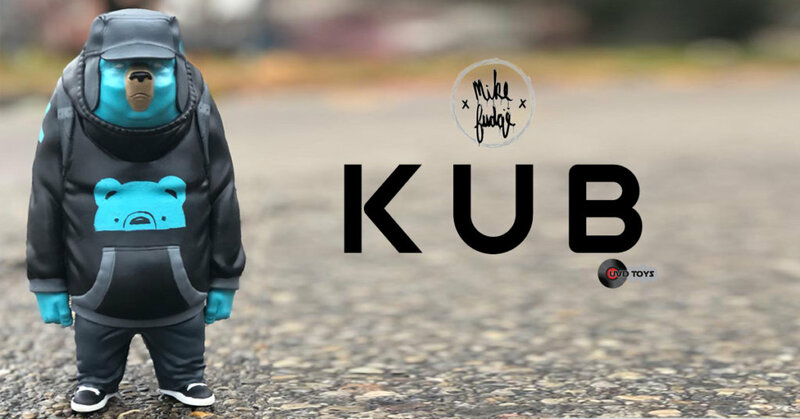 Last year the “KUB” PROTOTYPE by Mike Fudge x UVD toys and sculpted by our friend Karmieh Toy Design was shown HERE. Fast forward to 2018 and further developments have emerged and we get to see the full KUB prototype in its test painting stages! Last year to our surprise, it wasn’t a bust after all and it’s a freaking cool full figure. Dcon 2017 attendees were the first people to check out KUB with their own eyes as it was on show. Yesterday UVD reminded us KUB is nearly here! Time for KUB to pout back some urban in the scene. Like we said before, UVD Toys are riding on the crest of a wave with the worldwide success of Luna, so they don’t plan to rest on their laurels. Nope, they are working with Mike Fudge and Oasim Karmieh(sculpting) to bring Kub to life. Mike’s work is renowned, and we can’t wait to see what sort of colour schemes are going to be used for Kub. We don’t expect just the version below to be the only colourway. Back in 2014, we put the TTC Artist Spotlight on Mike Fudge, check out his work HERE. It’s rather exceptional. Lovely stuff. Go check out Mike Fudge on Instagram HERE.